What would you look for and like to have if you were to receive a new members welcome packet? This is a question that has many possible answers. As we try to reach out and bring many more people into our local congregation, we have a need to bring new members 'up to speed' with the way our congregation functions. Sometimes a welcome packet is used for this type of orientation and maybe you have some ideas for what should be included. If you do, post a comment below or email website@adorationurc.ca with your answers! On April 10, 2013, we ordained our first pastor, Rev. Norman Van Eeden Petersman, and began the next chapter of our growth and development as a congregation. Pastor Norm began serving our congregation as a pastoral intern in December and was then extended a call as to serve our church as our pastor in February. Joining us in the ordination service were a number of pastors who participated in the ordination service including, from left to right, Rev. Rand Lankheet, Rev. Chris Gordon, Rev. Christo Heiberg, Rev. Ray Sikkema, Rev. John Bouwers, and Rev. Donald McClure. On an incredibly hot day in August, the newly-established Adoration United Reformed Church met for the first time as a congregation of the Lord Jesus Christ. 35 families from a number of neighbouring churches decided to be a part of this new gathering. Our supporting churches that made this possible were Trinity United Reformed Church in St Catharines and Immanuel United Reformed Church in Jordan. 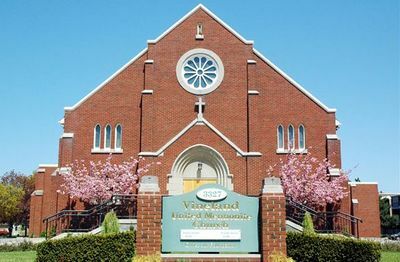 Initially services were held in the gymnasium of the Vineland United Mennonite Church building but soon it was possible (and necessary) to meet in the main auditorium. Since that time the Lord has blessed our congregation with new members and a new pastor. We are continuing to grow and discover what it means to be witnesses of the risen Christ in Vineland. We invite you to join us!